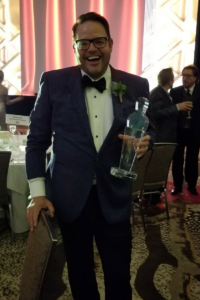 Congratulations to our very own Jay Baer! The Council of Peers Award for Excellence (CPAE) Speaker Hall of Fame®, honors professional speakers who have reached the top echelon of platform excellence. The award is not based on celebrity status, number of speeches, or amount of income. Rather, it is a rigorous peer-review process requiring excellence in five categories: message, presentation/delivery, experience, professionalism, and collateral material. To date, 237 men and women have been inducted into the CPAE Speaker Hall of Fame®. Up to five new inductees are named each year at a gala celebration held in conjunction with the National Speakers Association National Convention. There are currently 182 living members of the CPAE Speaker Hall of Fame®. The founder of five multi-million dollar companies, Jay helps companies create marketing, customer service, and customer experiences that customers love enough to talk about. His programs are customized and personalized for each audience, and include highly-relevant, real-world examples for every industry. An inductee of the World-of-Mouth Marketing Hall of Fame and winner of America’s Best Marketing Podcast, Jay is also Certified Speaking Professional (CSP), a designation held by fewer than 10% of the members belonging to the International Federation for Professional Speakers. Jay has advised more than 700 brands, including Caterpillar, Nike, The United Nations, and 32 of the Fortune 500 since getting started in online marketing in 1993. He is also the New York Times best-selling author of five books, the most retweeted person in the world among digital marketers, the second-most influential person in content marketing, and a certified BBQ judge. To bring our Hall of Fame Speaker Jay Baer to your next event, contact Michelle Joyce. Check back every Friday for additional featured speakers!